Find Better Ideas, Faster ® with a custom motherhood trend report, our PRO Dashboard and 80+ categories of premium trend reports. The Motherhood Trend Report will focus on the latest trends that are emerging with the realm of parenting with a specific focus on moms. This report shows readers how brands are reaching mothers through products, advertisements and marketing stunts. Using our crowdsourced research, we will feature the most innovative products that cater to moms and make parenting slightly more convenient. Additionally, we will show readers the platforms, support groups and social media outlets that encourage moms to be part of virtual and non-virtual communities. Brand managers and those who create products for parents or children will be able to use this report to better understand the motherhood demographic. This will ensure that brands are creating the right products and promoting them in the most logical way. 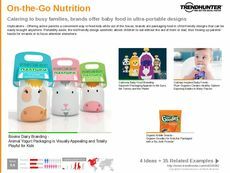 When launching a new campaign, platform or product geared towards moms, Trend Hunter's Motherhood Trend Report will equip you with the knowledge and insight needed to make your actions successful.